I’m quite a big fan of Xi Zhi Hao pu-erh. But even my infatuate eyes cannot ignore the fact that the production of San Ho Tang changes over the time. I believe, the change has two reasons. 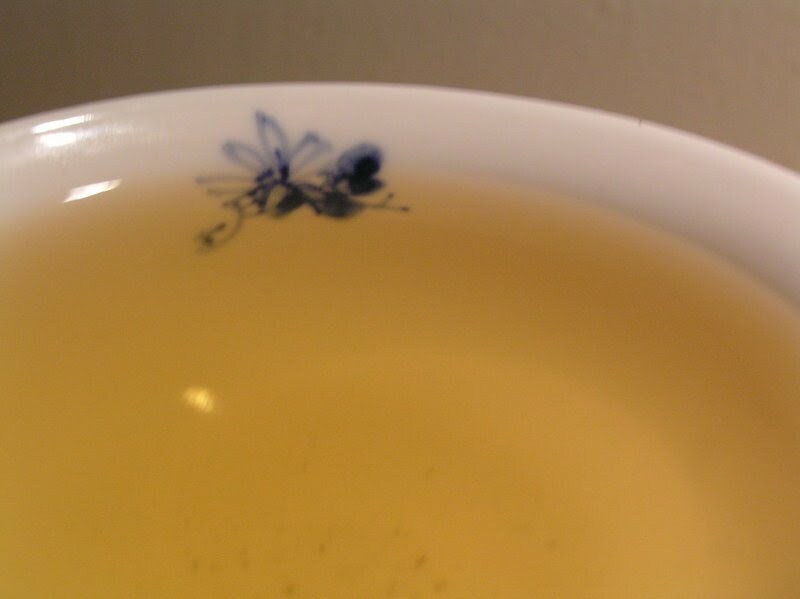 First is the increase of mao cha and pu-erh prices in late 2006 and early 2007. The increasing demand for good pu-erh leads to over harvesting of tea trees, faking and making good mao cha scare. So if a tea producer wanted to continue in making premium teas, he has to pay premium prices. The price of average and bad beengs may decrease, but I’m afraid, that we will pay for good pu-erh more and more each year. Increased production can lead to lower quality and as such it can destroy the reputation of company. Maybe focusing in fewer brands can help? I'm not sure. 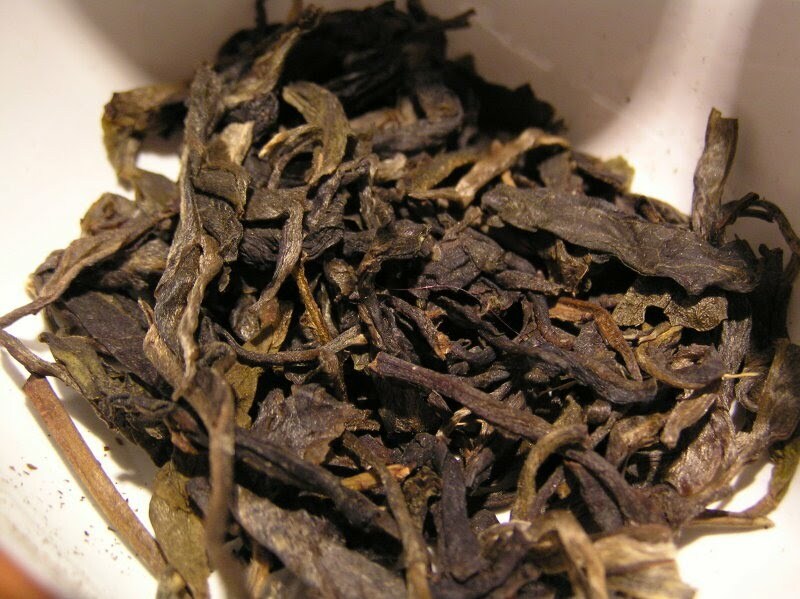 But my today's tea is from the early 2006 when the Xi Zhi Hao was name still highly priced among pu-erh connoisseurs. The beeng is stone molded, airy and not too tight, that good for aging and for loosening the leaves, too. Leaves are still quite green, being dry stored with me for a year or so. They emit rich woody and flowery aroma. The liquor is light amber, sweet with no sign of smokiness. The tea is thirst-quenching, powerful and complex, yet delicate enough. The aftertaste is slightly acidic, nearly a fruity and lasts very long, I can still feel the tea at my tongue, even after an hour or so. Maybe Xi Zhi Hao could produce tea like this one. Well, we will see the 2008 crop. Few weeks ago I received a pack of mao cha samples from Jacqueline. Thanks again! She obtained them on last Tea Expo held in May or so – the sample pack contains five different mao cha samples from different mountains. To prepare myself for tasting them I drunk today two years old mao cha from higher regions of Bulang mountain range, from remote tea plantations in Lao Ban Zhang. This mao cha was acquired by Guang as a special order from San Ho Tang tea factory. This tea is supposed to come from hundreds years old tea trees and the leaves look so. They are long and whole, many of them in two leafs one bud system. Unfortunately, many of the tea leaves broke while they got to me, because of their delicate shape, but there are still plenty of them too long to fit even into my tallest teapot. I had to soften the tea leaves with hot water, just like the spaghetti, before I was able to put the lid on the pot. The mao cha brew strong and thick soup – in second and third infusion I encountered an expressive smoky aroma, yet the rest of the infusions were very satisfactory. The tea reminded me the 2008 Pu Zhen Yuan Cha, with its strong character, nearly creamy aftertaste and bold spirit. Spent leaves are characterized by strong and high veins suggesting the wild ancestry of mao cha. If the 2006 Xi Zhi Hao Lao Ban Zhang (Yin and Yan) beengs are made of same material, their price of $145 could be acceptable. I got a sample of this fine tea from Salsero (thank you again!) today, so when I get to office and sat down I decided not to drink oolong today, but darjeeling tea instead. This Indian tea from Darjeeling province is, according to information provided by Salsero, sold by Tea Emporium as Flowery 2nd Flush SFTGFOP Darjeeling tea from Risheehat tea estate. Second flush (second harvest, mostly in June) of darjeeling teas is quite different from first flush. 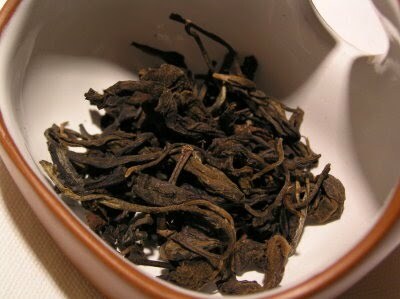 While the nature of first flush teas is much more green and fruity, the second flush teas I encountered before were closer to black teas. 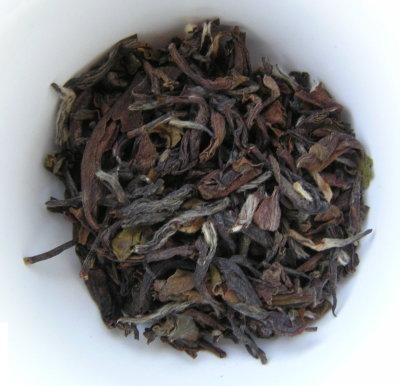 Judging from the color of leaves the fermentation in this darjeeling gone quite far. On the other hand, the “flowery” attribute turned on my imagination. 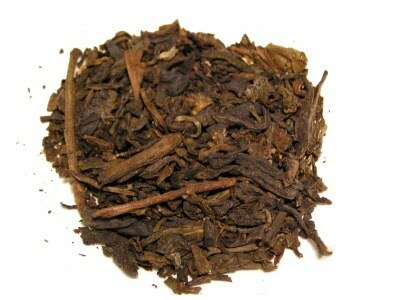 The tea makes dark orange color brew with distinctive fresh smell. While I found 2nd flush darjeelings quite heavy for my taste, this one is much lighter, though I will call it “fruity” instead of “flowery”. I can smell apricot and passionfruit in the brew. The taste sticks on tongue and leaves a light aftertaste behind. It’s lovely and enjoyable tea, a welcome change in my everyday tea-life. As always with the darjeeling teas, I prepared it in cast iron tetsubin using small amount of leaves with longer infusion time. I got this oolong from Hou De few weeks ago. I drunk Dong Ding oolong from Hou De last year and I liked it really much. It was very pleasant, very sweet, nearly candy like tea. 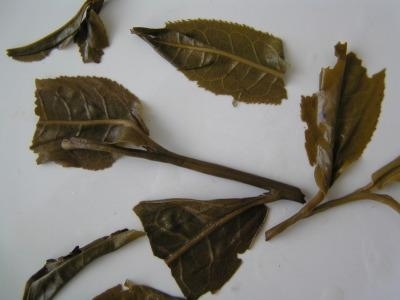 The Dong Ding (literally Frozen Summit - 冻顶 or 凍頂, source: Tea Babelcarp) is a traditional medium roasted Taiwan oolong. 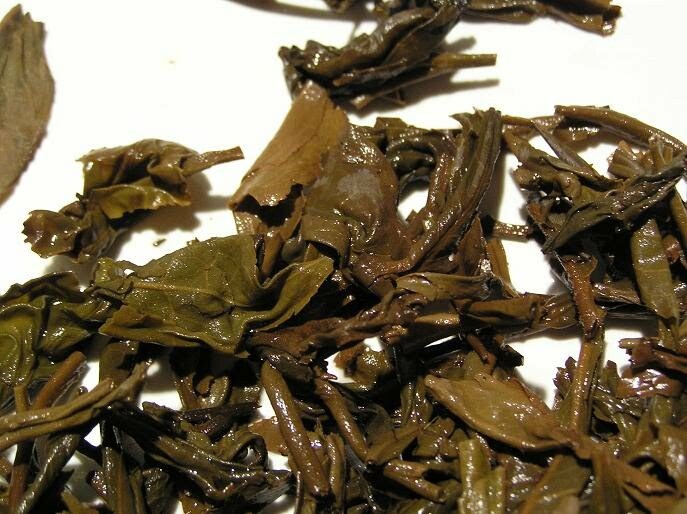 As the site claims, the Nantou style Dong Ding oolong was produced in January 2008 in Taiwan. The character of this vintage is quite different from the one I bought last year. The tea produces dark yellow, nearly amber liquor. The taste is sweet, slightly caramel with fruity undertones. The aftertaste is strong and leaves an acidic citrus feeling in the mouth. I feel this tea is pushed from the “caramel” to “fruity” side, like the roasting was lighter this year. Altogether I like the change, especially the aftertaste. I like this tea – the price is nice, so it’s affordable as an everyday beverage, yet the quality of the leaves and the taste is still good to very good. I prepare this tea using 4-6 grams of dry leaves in 120cc yixing, mostly making 8-9 infusions. I drink tea daily, different kinds at different places. If circumstances prevent me from drinking good tea I drink not-so-good teas, but at most cases I’m trying to drink the best tea possible prepared in the way it should be prepared. I especially like the tea prepared in gong fu style – it calms me down and tunes me in to enjoy the tea. 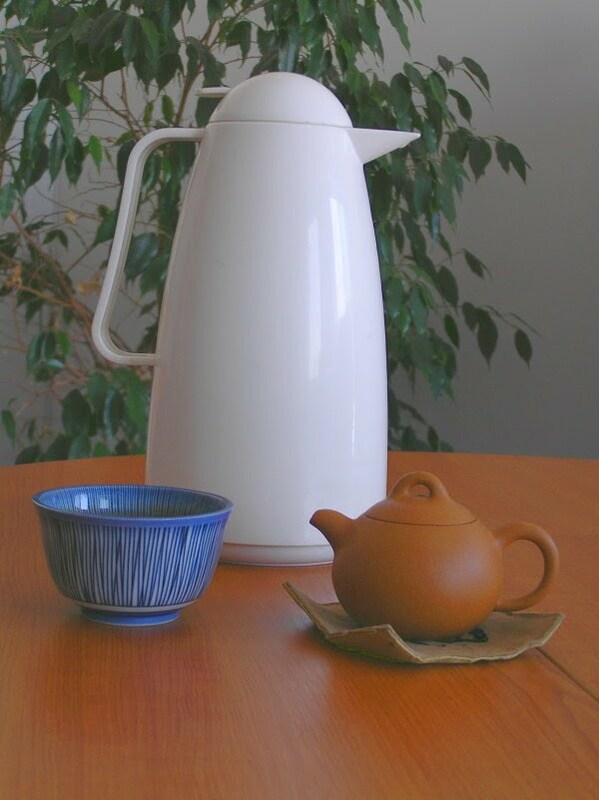 Since at office I have neither the required staidness nor the tea equipment I need, I developed my “gong fu light” tea ceremony. Fill the thermos with boiling water. It actually cools down a bit, so the water temperature should be 85-95 Celsius. Pour the water on the tea leaves, wait 10 seconds and spill the tea into the teacup. That way I can enjoy some rather good oolongs in my office without troubling myself too much. Today I felt autumn coming. It's raining all day long, the sun sets before 8 pm and the temperature decreased by 10 degrees. I decided to drink from my more than 10 years old Yi Wu beeng, I feel it is in harmony with the current weather. I purchased this beeng from HouDe two years ago. I believed that this beeng is quite expensive at $157 – and now I see how good that bargain was. Also, the pictures of one of my two beengs appeared in Art Of Tea Magazine issue 2 pages 31-32. This tea is calming. It smells and tastes partially aged, I feel a dry cellar in liquor. 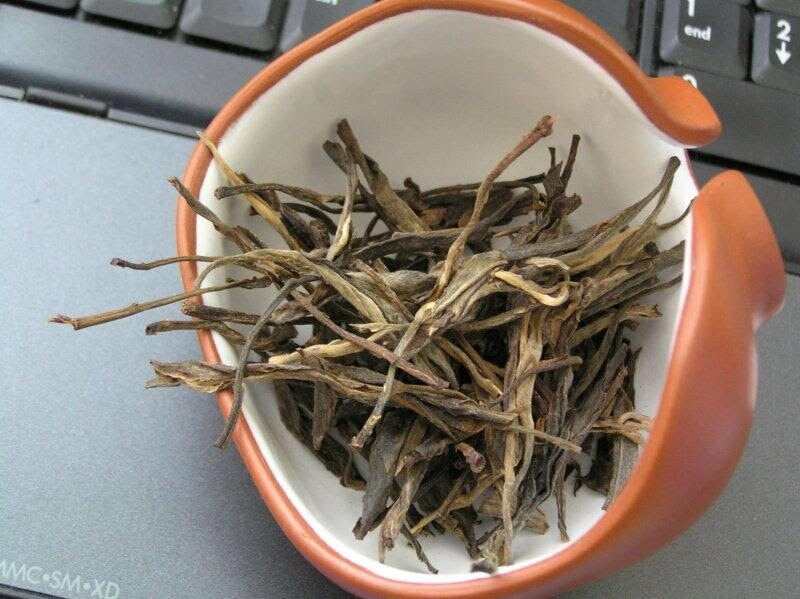 This tea was probably kept all of its lifetime in dry controlled climate – it feels lively and energetic. The Yi Wu taste is clearly present, plumy and fruity, sweet with long lasting aftertaste. The color of the liquor turned orange. I’m able to squeeze more than 12 infusions from this lovely tea. While I stop and 8th-10th infusion on most of pu-erh because of the radical unpleasant change in taste, this one goes further with honor. Leaves are bold and big. The beeng is stone molded, so it’s easy to loosen it without damaging the leaves. These beengs were made by now legendary tea factory San Ho Tang as “study” and they showed the way for equally good 2005 and maybe 2006 vintages. Top choice beeng, I wish I have more of them. Summer is coming to its end and autumn knocks on our doors. Last Saturday I was on a concert of Jaromir Nohavica – while the concert on castle Červený Kameň was hilarious the stormy night proved really cold. Actually, the castle on this photo is Smolenice, about 20 kilometres north of Červený Kameň. As the summer ends I’m more and more time at home and so I drink more and more tea. Fortunately, I got some parcels with really good teas, so I’m able to try and learn more and more teas. 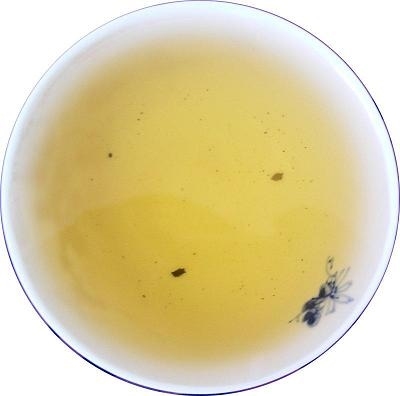 Today’s tea is from Guang, ten years old classical 8582 recipe by Menghai Tea Factory. The price of these beengs was quite adequate, so they sold out fast, in day or so. The leaves I used today were broken from my two beengs during they journey to Slovakia, so they are quite broken down. The color of the leaves is dark and there are lots of stems. The beeng was originally dry stored, yet I decided to wash it twice – mostly to wash out the smallest leaves and the tea dust. This tea definitely isn’t young, yet it still cannot be considered fully aged. The liquor is dark orange with spicy smell, the taste is semi aged, and round and smooth with similar spiciness I found in 2003 Henry Company 7542 beeng. It’s an OK tea, yet I will let it rest for another 5 or more years – it could improve with age.